At NetservIT, we understand how important it is to keep your business and your clients’ information secure. That’s why we use only the latest tools to identify and isolate virus and malware intrusions on your PC or laptop. 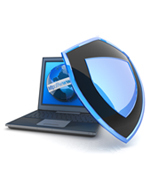 We can quickly identify and remove most malware and virus attacks. We also will work with you to recover your data and setup an online backup to further your file security. Please see Data Backup and Recovery for more information.